Lets’ not forget the Singapore Navy and their fleet of surface, submarine and air forces or their location. Or the Chinese and other South East Asian navies. Looking back after I wrote this piece, I feel that I should have addressed how the Chinese might react to the combined fleet concept. Unless the coalition fleet included them in some way, they might construe this as further evidence of threats posed by America’s “pivot to Asia” strategy. But that is a different matter. This article is what it is and addresses operational and tactical matters. Thank you for inviting me to review this blog post. It is a well thought out plan and does address the need for regional force cooperation and joint operations to deter the likes of the “not so sane” leaders of “rogue nations” in the area. I certainly am not a naval operations specialist by any means, and not entirely sure that lack of solidarity and force capability is the main reason that the North Korean leading family feels like they can make threats against both the United States and “her” allies. It is not wise to consider their rantings as total farce, but it is also logical that their capabilities to wage war against the much more well equipped and supported South Korean forces is very much lacking at present, much less with the backing of the United States forces in the area with strike capabilities far beyond what the North can muster or defend against. Of course this does not take into account the Chinese element as their ally and how much the Chinese detest the Japanese for invasions of decades past, or the other issues associated with their tenuous alliance with North Korea. The perceived threat is real, but how real is something that has to be considered when undertaking massive change in military operations in the area that will cost millions of dollars and thousands of hours of manpower to devise and implement. I do agree that cooperation among nations is a critical element in maintaining peace in the region, and that a military cooperative joint task force is not a bad idea. However it must, in my unschooled opinion, be as part of a larger canvas which includes economic, and diplomatic cooperation that will take away the need for North Korean politicians to use threats to gain U.S. economic and food assistance, which is how they have historically managed to get aid as part of a package to calm them down. This often has taken the form of threats to reinstall nuclear reactors with feeder capability for weapons grade nuclear material or an occasional lobbing of a “test” missile in our direction, and each time they back off once they get money and food aid. Of course this article is designed to show the operational feasibility of a joint naval presence in the region, but it has as it’s prime rationale to deter North Korea from aggressive military action. How do you see this joint naval presence growing? Is this something massive as I imagine or just sufficient to provide the needed added strength to stop N.Korea from actually making stupid moves across the DMZ? One carrier group or dozens? I see the concept, but I don’t see the scope mentioned, or was that in another article that I have yet to view? First of all, thank you for taking the time to read and respond to my blog series. Oh, now I understand. I have not had the privilege of reading your posts before in any forum or media so I apologize for not following the thread of your thinking. This clarifies the scope and the actual long term deployment aspect as an ongoing joint military exercise. There is an interesting comment by Scott about Japan’s willingness and/or ability to come to the aid of a partner vessel in an emergency situation based on the Japanese constitution (related to military intervention I assume); and an issue regarding sharing of information that is regarded as military secrets by participating countries. I look forward to reading your responses to those issues. As to scope and mission, I think you could make a case for a combined anti-ballistic missile defense (ABMD) force of AEGIS destroyers from the three countries, coordinating their efforts to defend both S. Korea and Japan. This might form the core of a later more comprehensive cooperation. Agree with Chuck – it will be important to figure out what exactly the bounds of their mission would be. You might also run into complications with Japan’s ability to (not) perform collective self-defense (i.e. come to the aid of a non-JMSDF vessel in this fleet that has been fired upon) in interpretation of their constitution. There may also be roadblocks in agreements to share data (in both a broad and technical sense) among all the participant vessels. To this, I should add that, according to BBC back in April, Japan “said it was co-operating closely with the US and South Korea to monitor the North’s next move” (http://www.bbc.co.uk/news/world-asia-22027867). So potential exists that Japan will cooperate–if it feels that its own security, and hence, interests are threatened. As to Hill’s suggestion for combined ABMD squadrons or flotillas, I like the concept. That will allow them to intercept and shoot down DPRK Musudans and whatever long-range missiles at the US-ROK-Japan alliance. Now, looking back, and I’ve mentioned this in the earlier response, I feel I should have discussed how the Chinese or the rest of Asia-Pacific countries may react to the combined concept. For one, this will indubitably anger the Chinese who may construe the expeditionary combined fleet as evidence of threats posed by the Obama Administration’s “pivot to Asia” strategy. Will it lead to a regional ” naval competition” as Gabe Collins argues in the Diplomat? That, we will have to wait and see. I hear you loud and clear on this. I must say that I support Abe’s position on the amendment of the existing constitution. 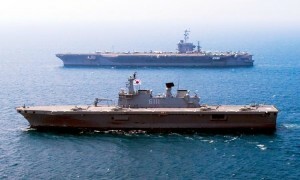 In light of the fact that Japan is in the midst of a territorial row with China over Senkaku/Diaoyu and feels threatened by DPRK’s belligerent threats, from the perspective of the Abe Administration, the amendment of the constitution so that the Japanese military would no longer be called “Self-Defense” Force makes perfect sense. Now, nowhere in the article did it say that the JSDF would withhold data with other allies in the event where it would be engaged in a collective security action. If you are concerned with command relationships (very valid) AND speak of bolstering amphibious capability, you should really revise your C2 structure to account for CATF/CLF. It took allies many hard lessons in 2 world wars to get something that worked (notice I didn’t put that in present tense). OPN HUSKY, OPN AVALANCHE, and OPN FORAGER may be good starting point for you to read what worked/didn’t work in the past. Point duly noted. Thank you.